"Genre defying and genuinely unexpected." Distrib Films US has debuted another new trailer for the highly underrated Brazilian horror film Good Manners, or originally As Boas Maneiras in Portuguese. I've been talking up this film ever since the London Film Festival last year. The first US trailer is not very good, but this is a much better trailer that finally gets into it more. Good Manners reinvents the werewolf genre in a completely eye-opening, breathtaking way. The story is about a lonely nurse hired by a wealthy, mysterious woman named Ana to be the the nanny for her unborn child. But she soon realizes things are a bit strange when she discovers Ana sleepwalks at night. Isabél Zuaa stars in this, with Marjorie Estiano, Miguel Lobo, Cida Moreira, Andréa Marquee, and Felipe Kenji. I flipped for it last year and haven't stopped thinking about it - read my review. Hopefully this trailer gets more of you curious, this film needs to be seen. You also watch the first official US trailer for Good Manners here, plus the original international trailer. In my review: "This Brazilian horror drama film falls under the category of WTF? !, but it's so so so good." Clara (Isabél Zuaa), a lonely nurse from the outskirts of São Paulo, is hired by mysterious and wealthy Ana as the nanny for her unborn child. The two women develop a strong bond, but a fateful night changes their plans. 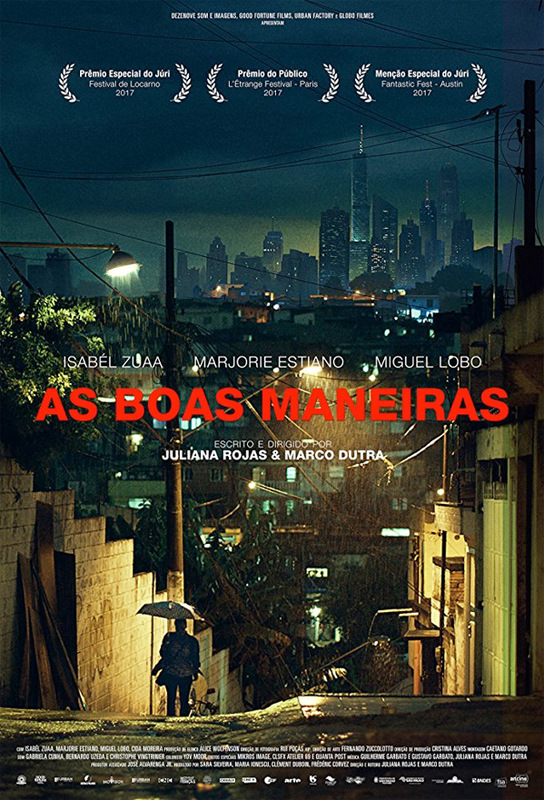 Good Manners is both written and directed by Brazilian filmmakers Marco Dutra (The Silence of the Sky, When I Was Alive, Hard Labor, The Shadows) & Juliana Rojas (Necropolis Symphony, Hard Labor, The Shadows). This premiered at the Locarno and Sitges Film Festivals last year, and also played at other fests including London, Busan, Istanbul, AFI Fest, and Fantastic Fest. Distrib Films US will finally release Good Manners in select US theaters starting July 27th this summer. Read our review and go see it.